A friend of mine asked me to do a drawing for his first wedding anniversary. Apparently the first anniversary you are supposed to give something made of paper. 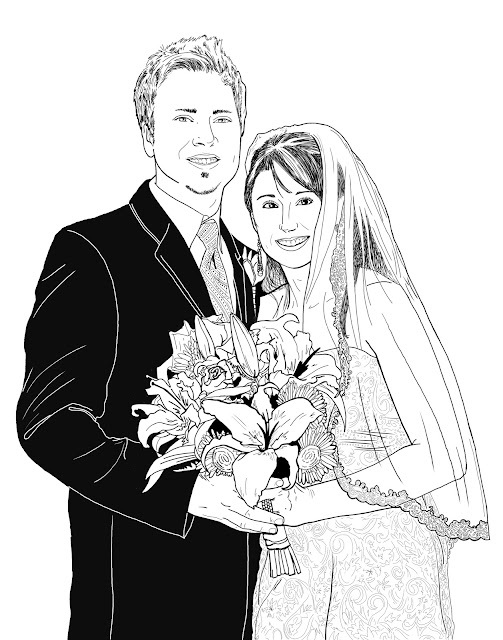 Naturally, he asked me to do a sketch of them from the wedding. I didn't like leaving it as just a pencil sketch so I went back over it with a black marker. I took that drawing and used live trace in Adobe Illustrator to vectorize it and even out the marker strokes. I took the final drawing and had it printed onto a marbled paper which looked really cool. They were both very happy with the end result.